"The Milwaukee Road's Western Extension"
From 1907 through 1909, the Milwaukee Road blasted a route through the Bitterroots, into the Inland Northwest and onward to Puget Sound. Today, you can explore the most spectacular section of the route on a bike or on foot. It’s called the Route of the Hiawatha, and mountain bikers flock to this trail from all over the country. Now, a new book titled “The Milwaukee Road’s Western Extension,” by Stan Johnson (Museum of North Idaho), tells a story as spectacular as the scenery. It’s the definitive chronicle of the building of the western arm of Milwaukee Road – full name, the Chicago, Milwaukee & St. Paul Railroad – considered at the time one of the most monumental engineering feats in the world. •The route included 35 tunnels – and that was just in Idaho. One tunnel, the St. Paul Tunnel (sometimes called the Taft Tunnel), is a mile and a half long. •Dozens of tough railroad towns – Taft, Adair, Grand Forks, Falcon, Avery – sprang up instantly. These towns were filled with a rich ethnic mix of Japanese, Serbs, Welsh, Greeks, Italians, Irish and French laborers. A group of Montenegrins and their “King” were embroiled in a murderous feud. •The railroad played a key role in one of the biggest natural disasters in the region’s history: the 1910 Montana-Idaho forest fires. Dozens of vivid historical photos help make the story come alive in Johnson’s book. Johnson, who grew up in Spokane, is an old hand when it comes to the Milwaukee Road. Johnson said the Milwaukee’s construction transcends other railroad-building epics, for several reasons. The work gangs didn’t start at one end and work toward the other, nor did they start at both ends and work toward the middle. Another reason: The Milwaukee Route over the Bitterroots was one of the steepest and most daunting mountain crossings imaginable. The Great Northern and Northern Pacific railroads had already taken the easier passes. The Milwaukee surveyors had no choice but to head into the teeth of the Bitterroot Range and construct a route requiring dozens of tunnels, massive bridges, terrifyingly high trestles and complicated looping switchbacks. To do so, they had to plop thousands of laborers right into the middle of the Idaho-Montana wilderness. Wild new towns sprang up overnight: East Portal at the east entrance to the St. Paul Tunnel; Roland at the west entrance; Adair at the head of the route’s giant “loop” up Loop Creek; Grand Forks and Falcon farther down Loop Creek; and Avery, where the railroad hit the St. Joe River. Grand Forks, on the other side of the big tunnel, was smaller but just as wicked. Saloons and brothels lined the muddy streets. The most lurid Taft story documented by Johnson involved a group of Montenegrin laborers. They had been hired as a group from the same area of the home country – a common practice – with their own leader they called The King. Their crew boss, however, was not Montenegrin. His name was Reddy Hayes and one day, during a dispute, he loudly reprimanded The King. Later that night, probably in a saloon, someone snuck up behind Hayes and hit him in the head. He escaped further injury, but when Hayes showed up the next morning at the work site, the Montenegrins and their King refused to work. Hayes bawled them out. Threats escalated. Guns were drawn. Hayes shot The King dead. Hayes immediately high-tailed it to Missoula. That was wise because the Montenegrins were in a foul mood. But first, they had to bury The King. Later they began to drink, dance and sing what sounded like “a menacing song of vengeance.” Their new leader, a man named Stanislaus Filipowich, talked them out of violence. For a while. Hayes was charged with murder but found not guilty by reason of self-defense. A year later, apparently thinking it had all blown over, he returned to Taft with a different work crew. On his first morning on the job, gunshots rang out. Six people were found dead; Hayes and five Montenegrins. The railroad camps were a cosmopolitan mix of nationalities from just about every European country. Italians were particularly numerous. They were well-known for building dome rock ovens and baking bread. The aroma of yeast wafted through the sub-alpine firs. The Japanese were also represented, especially in the Avery area. Johnson estimated that there were several hundred Japanese workers in Avery, some of whom stayed on after the railroad was finished. Most workers, however, were transient; they were off to the next construction project as soon as this one was finished. The railroad was ready to roll in a remarkably short time. 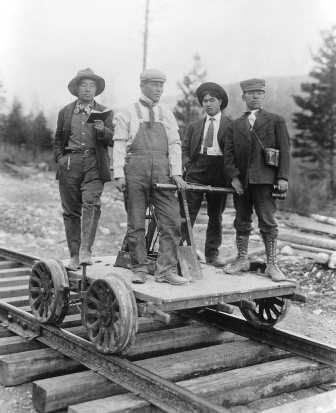 The first trains came through in the summer of 1909, but that didn’t mean work on the road was complete. Crews had built dozens of rickety-looking wooden trestles across draws and streams, just to get the line up and running. For the next few years, crews replaced these trestles with more permanent steel bridges or, in many cases, with enormous quantities of dirt and fill. This trestle-replacement project was accelerated in 1910 for one smoky, overriding reason. In August of that year, dozens of fires erupted in the Bitterroots and Coeur d’Alenes, most sparked by lightning – and maybe a few by locomotive cinders. On one fateful day, Aug. 20, 1910, several huge fires were blown together by high winds and created one of the most terrifying firestorms in the region’s history. “Along the Milwaukee’s new route everything was suddenly at risk from Plummer, Idaho, to Missoula, Montana,” writes Johnson. No place was safe – except those cool, dark tunnels. “People on both sides of St. Paul Pass fled to the tunnel for safety,” wrote Johnson. Emergency trains picked up people from the towns and work camps along the route, yet some of those trains found themselves blocked by fire. One train pulled into the 1,516-foot Moss Creek tunnel and waited out the fire for more than a day. Another rescue train, blocked by fire, backed into a 460-foot tunnel and stayed there. 121 people waited in the dark while the fire blew past. Taft, East Portal, Grand Forks, Falcon and Adair were mostly wiped out. Avery escaped destruction, because its residents set a backfire which kept the firestorm at bay. Nearly 100 people died in the fire, most of them firefighters. “It was so bad that even some of the rails melted and were twisted,” said Johnson. Yet it took only six weeks to get the railroad back up and running. The wooden trestles, many of which burned, had been scheduled for replacement anyway. The fire also accelerated another Milwaukee Road innovation: the conversion to electricity. Between 1914 and 1917, the route all the way from Harlowton, Mont., to Avery switched to electric locomotives, powered by overhead power lines in the manner of trolley cars. Electricity made sense. Engineers had discovered that it was hard to produce enough steam in the brutal cold Bitterroot winters; electric motors produced no choking smoke in the long tunnels; the dynamos could actually generate electricity on the long downhill stretches; and no cinders were thrown out. The Milwaukee’s prestigious passenger trains – namely the Columbian, the Olympian and later the Olympian Hiawatha – were routed north from Plummer into Spokane’s newly built Union Station, which it shared with the Union Pacific. Johnson devotes extensive space to the construction of that depot in his book. Meanwhile, most of the freight trains were routed straight from Plummer to Othello and then on to Seattle-Tacoma, because it was the faster route. The Milwaukee went through a series of financial crises in the 1960s and 1970s. By 1980, the western part of Milwaukee Road was abandoned; the entire line went belly-up in 1986. Yet the Milwaukee right-of-way remains part of our region’s culture. In addition to the Route of the Hiawatha trail, much of the abandoned Milwaukee route across Washington has become the John Wayne Pioneer Trail and the Milwaukee Road corridor, which will someday allow bikers, hikers and horseback riders to go all the way from the Idaho border to Cedar Falls, on the west side of the Cascades. And as for wild, woolly Taft? It’s nothing but a deserted I-90 freeway exit, a few miles past Lookout Pass on the Montana side. The most wicked city in America has reverted to huckleberries and Indian paintbrush.